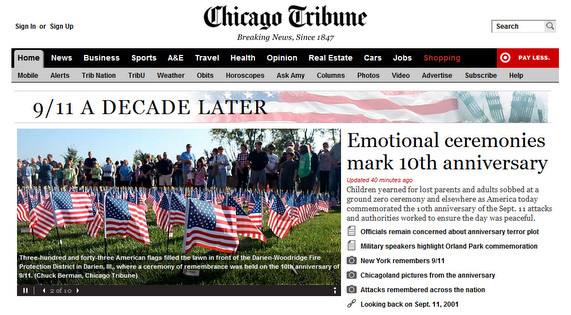 The 10,000 Words blog has created a slideshow of screenshots showing the homepages of 45 newspaper, broadcaster, blog and other online news outlet websites on Sunday, the ten year anniversary of 9/11, showing their coverage between 10am and 11am Pacific Standard Time. There is also an original gallery of shots which were captured between 12.30am and 1.30am PST (8.30am to 9.30am GMT) here. Read more on 10,000 Words. This entry was posted in Editors' pick, Online Journalism and tagged 10000 Words, 9/11, homepage, images, news site, September 11 on September 12, 2011 by Rachel Bartlett. 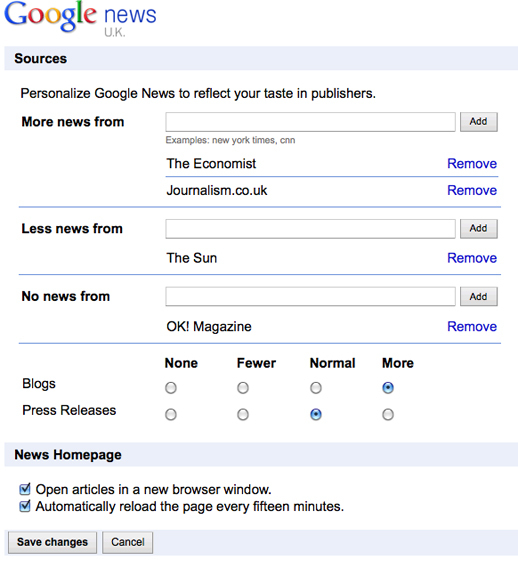 Google News has made updates to allow users to further personalise the type of news they read. Readers can now omit sites, choose to read more news from a selected site, increase or decrease the amount of blogs that appear or batch exclude all blogs from their Google News home page at one fell swoop. Both blogs and news sites need to check how they are categorised by Google News. Just because you do not describe your site as a blog, doesn’t mean that Google News hasn’t listed you as one. This entry was posted in Hyperlocal, Online Journalism, Social media and blogging, Traffic and tagged blog search, bloggers, blogs, Google News, news site, search engine land on May 17, 2011 by Sarah Marshall. Journalism.co.uk consulting editor Colin Meek (@colinmeek) found himself stranded recently in Oslo, Norway but was rescued thanks to some nifty footwork by Kristine Lowe and an online project from Norwegian news site VG.no entitled Hitchhikers Central. This entry was posted in Handy tools and technology, Search and tagged Colin Meek, consulting editor, Entertainment/Culture, Europe, Geography, investigative journalist, Journalism.co.uk, Kristine Lowe, London, news site, Norway, Norwegian Online News Association, online project, online research skills, Oslo on April 20, 2010 by John Thompson. This entry was posted in Editors' pick, Online Journalism and tagged business model, harris interactive, Harris Poll, news site, online access, online subscriptions, paid content, paidcontentuk, pay-for content, pcuk, United Kingdom on September 24, 2009 by Judith Townend. PaidContent:UK has this week launched a series about online payment models, using the results of a poll conducted by Harris Interactive. Its first story reported that if newspaper groups were to begin charging for their websites, three quarters of users would abandon them in favour of a free alternative. The research, which polled 1,188 British adults, found that among users who read a free site at least once a month as their top source of news, only five per cent would pay for that website, if such a payment model was introduced. Seventy-four per cent would find a free alternative news source; a further eight percent would continue reading the website’s free headlines only; and 12 per cent were not sure what they would do. Per-article fees (ie. micropayments) are the favourite option for 21 percent. A day pass giving unlimited articles within a 24-hour period is favoured by 26 per cent. But a subscription of up to a year is the most desired model, supported by 54 per cent. So what does this mean for micropayment models? “There’s been a lot of buzz about micro-payment recently, and some prominent players, like Google have moved into this field,” said Andrew Freeman, the senior consultant with Harris Interactive’s technology, media and telecoms team. “But there are massive challenges: and not just technical ones. From a simple business point of view, micropayments are disproportionately expensive to administer. Until you have an enormous volume and value, it just won’t be worthwhile. “The likelihood of newspapers instituting online charging models has become a hot topic. But the debate has mostly been led by what the publishers, and not the readers, want. We felt it was important to ask them and put some data in the public domain to inform publishers currently faced with this decision,” paidContent:UK editor, Robert Andrews, told Journalism.co.uk. Although they didn’t ask about specific news categories for this survey, paidContent:UK hopes to take these questions to consumers in a follow-up survey, he added. Forthcoming stories will look at what price consumers would be happy to pay; and whether including a newspaper subscription would affect users’ willingness to pay online. “The top-line results are in line with my expectations. Conventional wisdom that has grown up around this debate in recent months has told us that, whilst there may be a pay-for market for mission-critical, business or niche news content, there’s enough plurality in the global consumer news market that readers can find an alternative source with just a few mouse clicks,” said Andrews. “But some specific findings surprised me. For example, those in their teens and early 20s are many times more likely to say they’ll pay than those aged 35 to 54, whom I would have thought would have more disposable income. “Publishers will need to carefully consider the effects of implementing a pay wall before mixing their cement – our survey suggests most of their readers would flee to a rival paper,” Andrews said. This entry was posted in Online Journalism and tagged Andrew Freeman, business model, cement, editor, favourite site, google, Harris, harris interactive, Journalism. co.uk, news site, online charging, online payment models, paid content, paidcontentuk, pay-for content, Robert Andrews, senior consultant, United Kingdom, Wales on September 22, 2009 by Judith Townend. A round-up of reports that a local Florida newspaper is planning to charge candidates in a local mayoral election for coverage. An email from the publication’s editor Tom Oosterhoudt to two of the candidates explained that others had had their campaigns covered, because they had already purchased advertising with the title, Conch Color. “As far as candidate forums and debates, we’ll cover those when we can, but if candidates want their campaign covered, they have to pay to play,” Oosterhoudt told fellow Florida news site, Keynews.com. In July the Washington Post was heavily criticised for offering paid-for access to exclusive ‘salons’ with officials from Barack Obama’s administration. The paper later dropped the plans. This entry was posted in Editors' pick, Newspapers, Press freedom and ethics and tagged Barack Obama, Barack Obama's administration, editor, Florida, Keynews.com, news site, purchased advertising, Tom Oosterhoudt, United States, us, Washington Post on September 10, 2009 by Laura Oliver. This entry was posted in Journalism Daily and tagged Anna Politkovskaya, BBC, cameraman, e-editions, e-newsletter, editor, jason craig, Journalism Daily, Journalism. co.uk, Julian Owen, knight news challenge 2010, New York Times, news site, newspaper licensing agency, reuters, Rue89, Sky News, the Journalism Daily, United States, Washington Post, webcom on September 3, 2009 by Judith Townend. ReadWriteWeb follows up Wikileaks’ report that Google could comply with an order to supply the IP addresses used to access a news site’s GMail account, as part of a libel claim in the Santa Clara, California Superior Court, regarding government corruption in the Turks & Caicos Islands. According to Wikileaks and RWW, Google intends to hand over the requested records in just over two weeks, unless the Journal files a counter-motion with the court itself. Google has supplied RWW with a statement that said the company was ‘still evaluating all [its] legal options regarding this particular request’. This entry was posted in Editors' pick, Legal, Press freedom and ethics, Social media and blogging and tagged Caicos Islands, California Superior Court, caribbean, commentary site, gmail, google, ip address, news site, Santa Clara, tci journal, The TCI Journal, UK government, Wikileaks on September 1, 2009 by Judith Townend. Media consultant Arnon Mishkin argues that the value of linking between sites is getting captured by aggregators rather than by the news sites that they scrape and link to. “Even in an absolute best-case scenario for producers of original content, the aggregators get at least as much traffic on linked stories as the creators of those stories because anyone who clicks on the link does so from the aggregator’s site (so each site gets a page view),” he writes. Look at ‘wadgets’ – a combination of content and advertising – rather than ‘widgets’ purely offering a site’s material. This would allow them to monetise some of the traffic on the aggregators site. The AP’s recent suggestion that it will creating landing pages for members’ news content and introduce a advertising revenue share arrangement seems to go some way to meeting Mishkin’s recommendations. Interesting thoughts in a week where user-powered aggregator Digg introduced its new ad system. The question of how much revenue aggregation sites are generating should also be considered. Related: see Publish2 founder Scott Karp’s thoughts on newspapers and the link economy. This entry was posted in Editors' pick, Online Journalism and tagged advertising revenue share arrangement, aggregation, aggregator, Arnon Mishkin, link economy, media consultant, news site, Scott Karp on August 14, 2009 by Laura Oliver. A little while ago Journalism.co.uk asked for examples of journalism students’ projects. Feel free to send more, whether you’re midway through, or at the end, of a course. 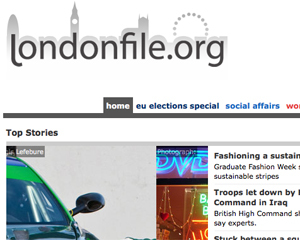 As mentioned in the last post, City University MA International Journalism students (2008-2009) produced the London File, at this link. Now their course is over, the news stories are out-of-date but the sites is still live for a visit. The team’s overall goal was to ‘to capture and report the realities and issues on the ground in London, as they happen’. site five weeks before we went live, and planned to keep up loading new content to the site on a rolling deadline for two weeks. “The two weeks were a really intense time. We were responsible for every aspect of the site, from getting the content to designing the pages, and it was a lot of work balancing all of the different jobs necessary – getting a website to work as well as going out and being journalists. This entry was posted in Online Journalism, Training and tagged Annabel Symington, City University, editor-in-chief, European Union, Journalism.co.uk, London, Massachusetts, news site, the london file on July 1, 2009 by Judith Townend.